Whale Sniper is a fancy volume monitor. It is designed to spot sudden spikes in volume as they happen on the exchanges. You can now never miss important market action again. 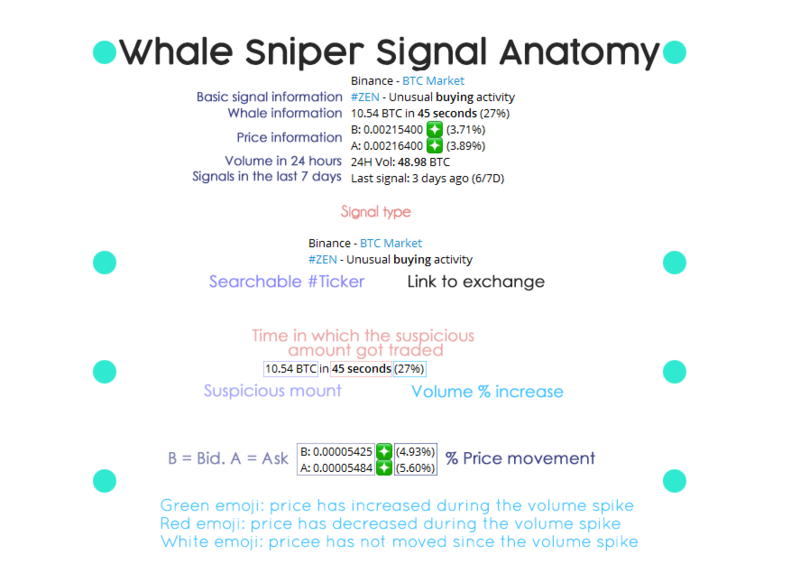 Whale Sniper is not only designed to spot sudden spikes but also subtle accumulations on the exchanges. Whale Sniper provides enough information for you to understand what happened. Let's review the anatomy of a signal from Whale Sniper. Each signal starts with the exchange and the base market. This base market includes a direct link to the exchange. #Ticker of the coin (searchable, you can click to view past signals directly on Telegram). An assumption of what happened is included. This assumption may be unusual buying or selling activity. When it is not clear what happened, a simple 'Unusual activity' will be included. Current Bid and Ask. Emojis mean something here! The numbers in paranthesis refer to how much the price has moved. Signals in the last 7 days. The first value refers to the last signal while the value in parenthesis refers to how many times the asset has been signaled in the past 7 days. Amount and time: the time in which the action happened can tell us a lot. Unusual selling activity + short time frame = likely a flash crash. Once you are used to see the signals (and track their results), you’ll begin to notice the patterns. Signal price: see with more detail what happened in the market, its actual data of how much the price moved. The emojis provide a way to pick our favorite type of signals at a glance. Volume: this is provided to disregard at a glance coins with low volatility and pump and dump traps. Generic but important advice: avoid low volume coins. Low volume equals to low liquidity. Low liquidity equals to more price manipulation, clearly not something we want to hop into. Since everyone has their own personal view on what is low volume, pick a number you consider good enough. Always ask yourself why. Someone bought $500,000 worth of an altcoin in less than 10 minutes. Why? Why would anyone in the world do that? Insider info? Upcoming release or event? Partnerships? Pump and dump? Keep a close eye on the amount of signals generated during the last 7 days, as well the volume of those past signals. Increasing volume is a good sign. If you are at the top of the candle, avoid buying at market price. The philosophy of buying high to sell higher won’t work 100% of the times. Sharks are swimming under the crypto seas, and sometimes, those sharks turn out to be true whales. We created a tool to snipe those smaller whales called Shark Sniper.